Well, they aren't The Moffats. I was fooled by the cover into thinking that this was a classic (I didn't bother to check the copyright date - March 2007). Very cleaver choice on the part of the publisher! It certainly has the feel of a classic. It's quaint. It's charming. It has a big white house with pillars and a music room. It has a charming cottage with four fantastic bedrooms. It has four girls that made me (briefly) think of Little Women. Out-of-touch single dad trying to raise four kids on his own after his wife dies? Check! Crazy but lovable and loyal pooch? Check, check! Bad guys to hate! Fantastic housekeeper named Churchill! Coming of age romance! Danger and hilarity. All of this and much, much more. The Penderwicks is cute. I think it is dated primarily because of the Rosalind's, (oldest Penderwick sister), fascination with the 19 year old gardener. Her crush feels too modern in description. If that had been left out of the tale, it would have had both the look and the feel of a classic. So I'm a little disappointed but that's not a strong recommendation against the book or anything. I can see how this would be a well-liked book. Apparently it is well-liked enough to birth a sequel, The Penderwicks on Gardam Street. 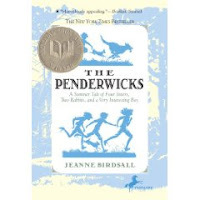 I don't think I'll read it but if you find yourself liking the Penderwicks, have hope! I have a feeling there's more to come. I'd never heard of this book. And yes, I hate it too when you think something is set or written at a certain time and find it wasn't. Kind of a let-down. Speaking of single-dad's raising kids and all -- did you ever see Nanny McPhee? Not based off a book, but a cute story nonetheless. It also reminded me a little of Little Women but paled in comparison. I don't plan to read the sequel either. It was cute but there are better stories of a similar nature out there.